I'd like to share a card with you today that I had completely forgotten about. 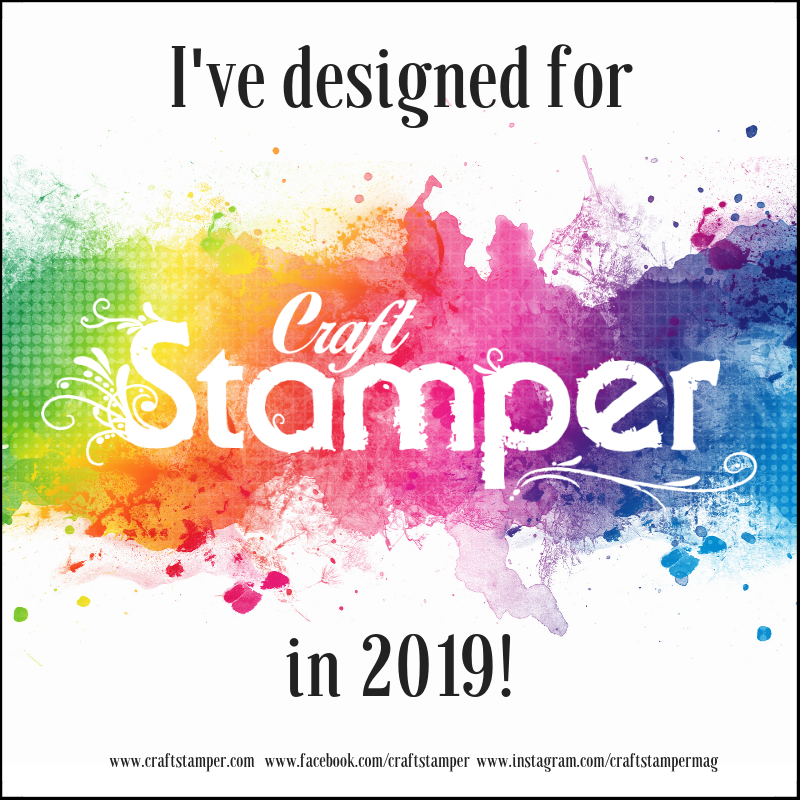 It's the one that I had published in the April edition of Craft Stamper magazine. 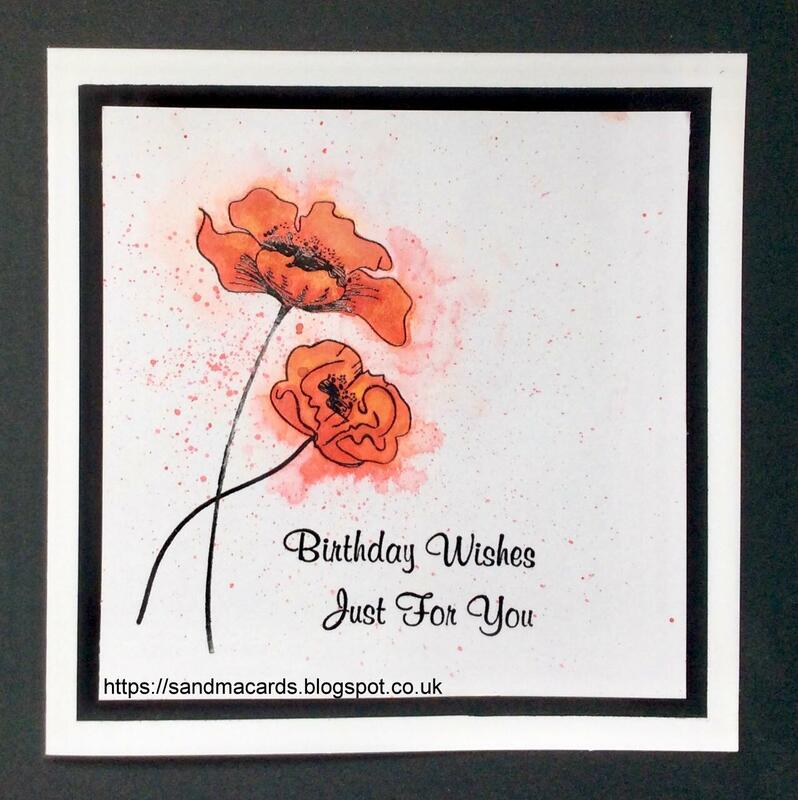 I think the reason I always forget these cards is because Craft Stamper don't like you to publish the full photo until their next edition has been published, by which time I've usually forgotten all about it! The gorgeous lady stamp is by Flonz Craft and all other stamps are by Inkylicious. I used a white Posca marker to splatter the stars in the background. Well what a great start to the long Bank holiday. The weather has been glorious and if we believe what the forecasters say, then it's going to be ever warmer over the next few days. I hope you all enjoy the break, whatever you may be doing. 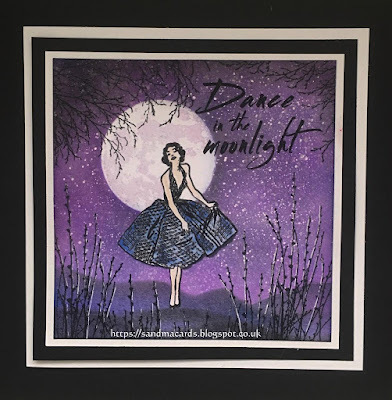 Now I don't know if it's just me but blog land just seems to be getting quieter and quieter all the time and lots of familiar faces seem to be disappearing. I know that 'Google Plus' being removed may have something to do with it, or it could be the whole GDPR fiasco. Maybe people are feeling that it's not worth the trouble. I think that social media may also be playing a big part. 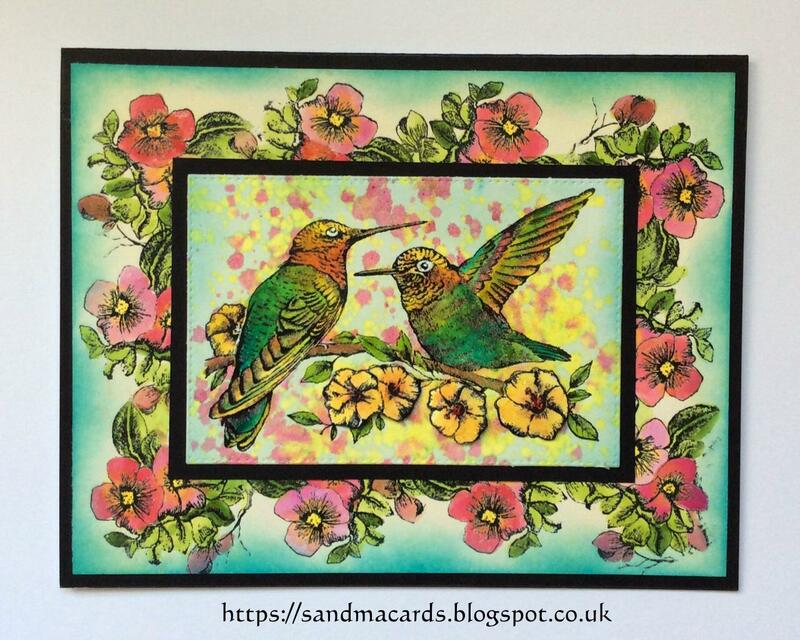 I've very recently joined Instagram @Sandmacards and it's so easy to upload a photo, add a few #tags, and that's it really. When visiting other pages, it's easy to click the 'Like' button and most comments are fairly short and to the point. I know it's not the same as visiting a blog where you can explain how the card was made, also it always feels to me like I'm visiting a group of like minded friends where we share each other's joys and sorrows. Maybe it's just me but I'd be interested to see how you all feel about it as it. 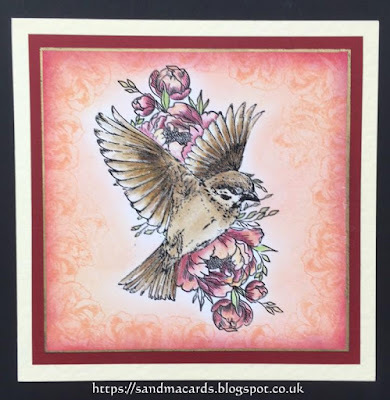 All the stamps that I've use on this card were freebies from issue 67 of 'Creative Stamping' magazine. It's a fabulous set that I know that I'll use time and time again. I have to say that their latest issue looks a good set too, and again the main focal stamp are by Crafty Individuals. The ink that I've used are Distress and Adirondacks, and as always now, stamped in VersaFine Clair. I don't have any showers on this one but I have brought you some May flowers. The main focal image is made up of two separate stamps. 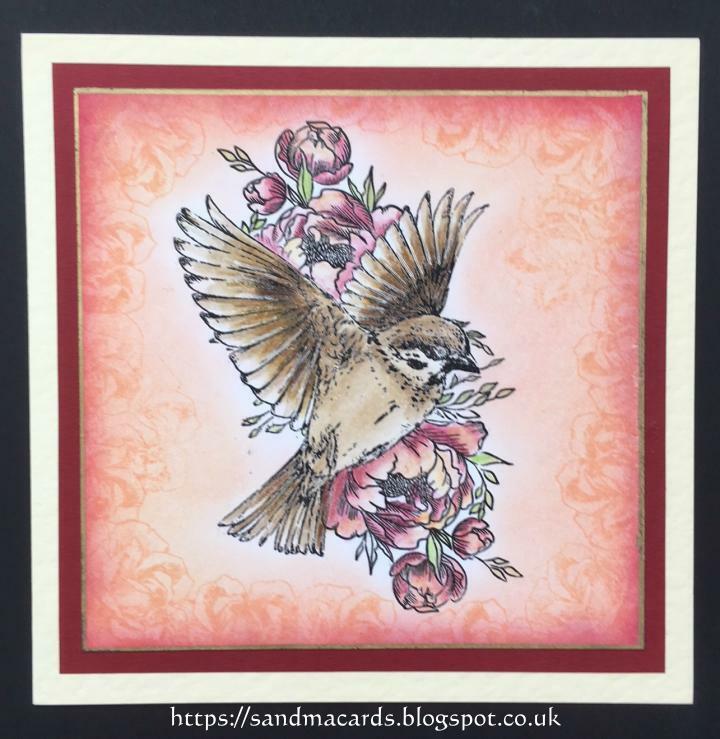 The bird is by Inkylicious and the flowers are by Stacey Barras who designs for Crafters Companion. Stacey does have a stamp that looks very much like these combined images but I thought rather than buy another stamp, that I would use the two stamps that I already had. I started by stamping and the masking off the bird before over stamping with the flowers. Next, I coloured the image with Derwent Inktense pencils and Distress inks. 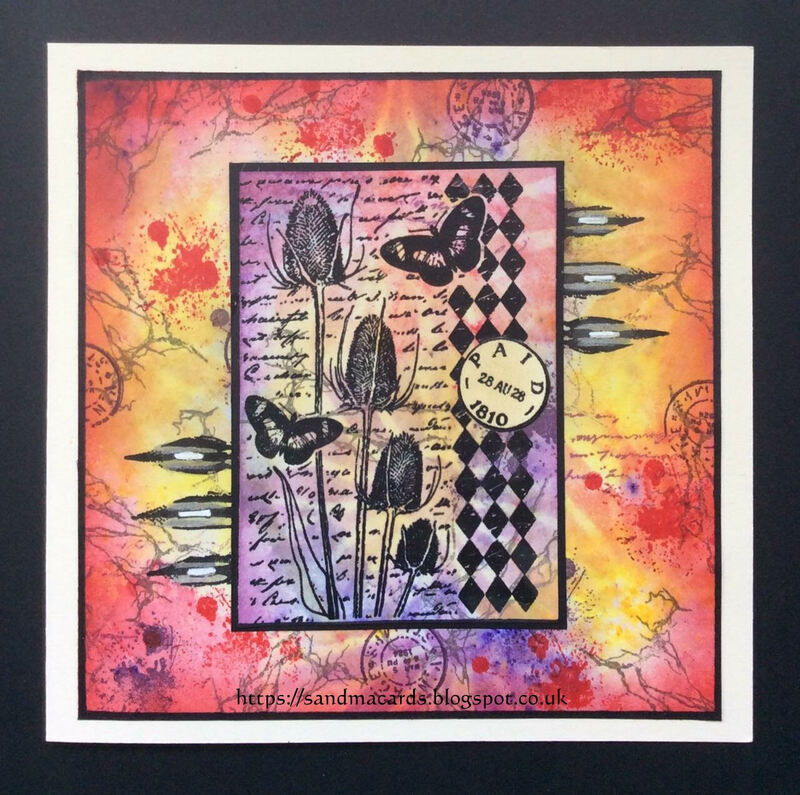 I randomly stamped around the edge of my card with another of Stacey's stamps and then I used a blending tool with Adirondack Cranberry ink to create a darker edge. 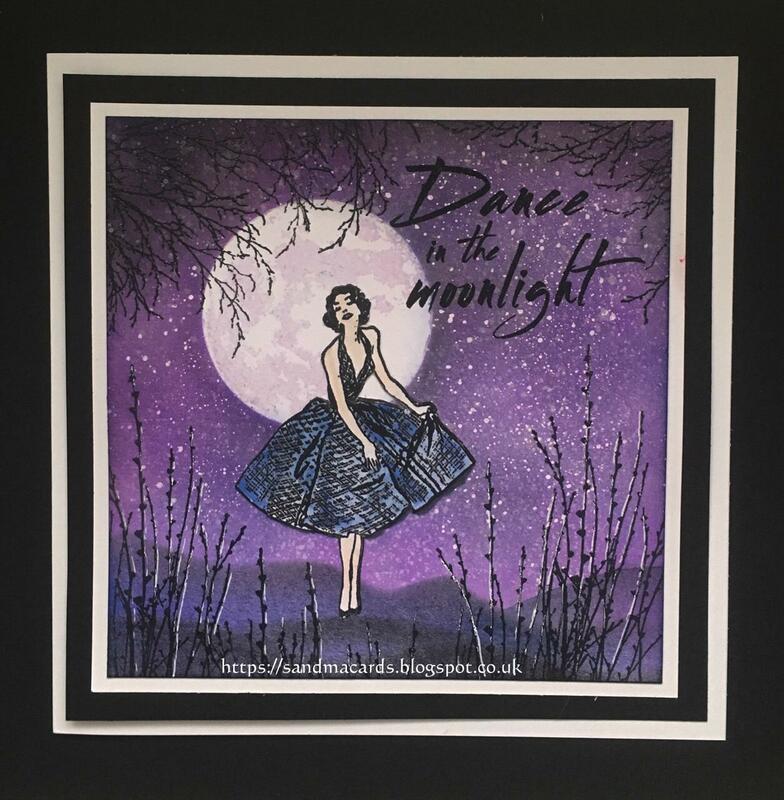 Quite a lot of work involved with this card but I think it was worth it in the end and the person that I sent it too loved it, so that always makes me happy. who are kindly offering the lucky winner a £25 voucher to spend at their online store. We would really love it if you could join us with a piece of your artwork featuring this month's theme but please remember that Stamping Sensations is a 'STAMPING' challenge, so we must see a stamped image, sentiment or quote as the focal element of your artwork, this means: Stamping must be the central point of attention and interest. Hello there my Crafty friends. I hope that life is treating you kind. If not, then I wish you happier days to come. 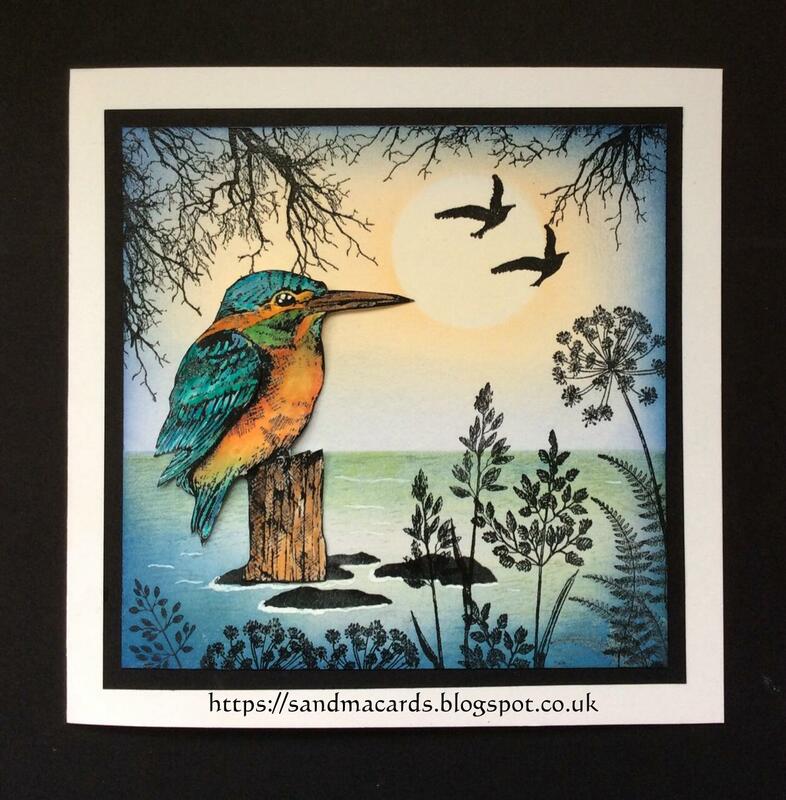 As you can see, I've created a tranquil, water scene for the Kingfisher, and doesn't he look right at home there. 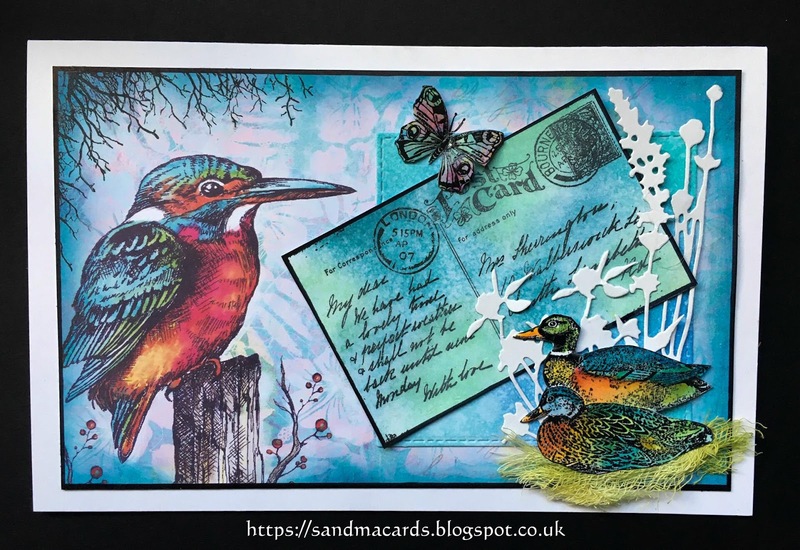 I used my Ink Dusters to make the background and then I stamped and fussy cut the Kingfisher before using lots of other Crafty Individual stamps to build up the scene. 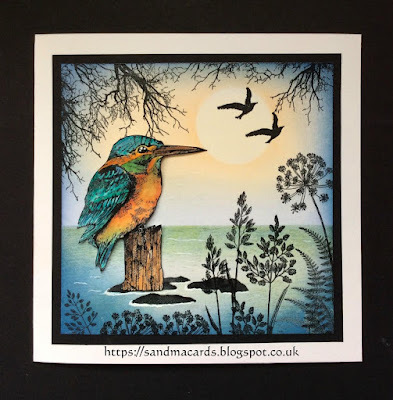 I've coloured my bird with Distress inks and Koh-I-Noor and used the same inks in the background so that it all co-ordinates well together. 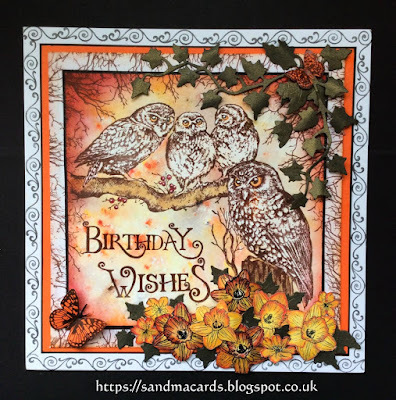 This time using one of Jean's new papers which are just yummy! They are so beautiful that I really didn't want to start cutting them up. 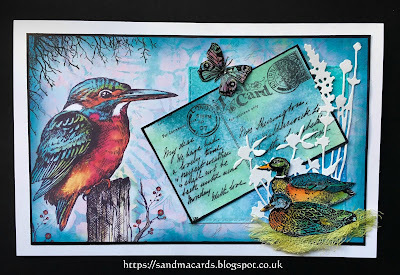 This one uses quite a large image of Kingfisher stamp and so I used other CI stamps and some Tim Holtz florals to complete my card. I used a little dyed cheesecloth under my ducks to make it look like they were nesting. 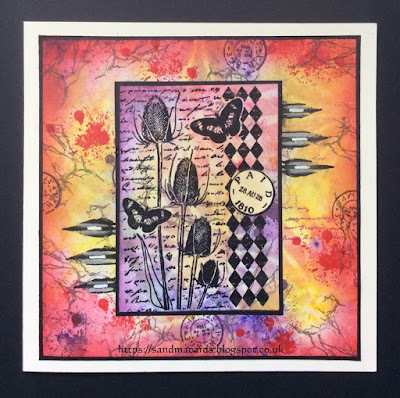 All of the new stamps and papers are now available on the 'Crafty Individuals' web site and are on offer for a short while. 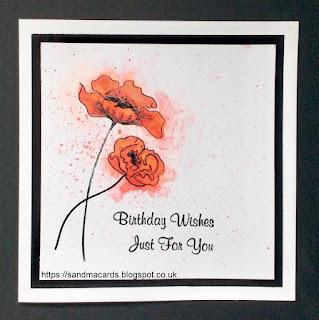 I used the 'Water Colour Poppies' set by Inkylicious and I started by stamping and then heat embossing the Poppies with VersaFine Claire Nocturn. Next I inked up the solid Poppy stamp with a yellow Distress Oxide, then with Adirondack Watermelon before spritzing it with water and then stamping it over my outline Poppy stamp. Once I was happy with the colour, I then spritzed the whole image with a fine water mist to cause the inks to bleed out. I should probably have left it there but I added some red splatters over the image. To finish, I added my sentiment. It's all very different for me but I'm happy with how it turned out and it's another one for my stash. 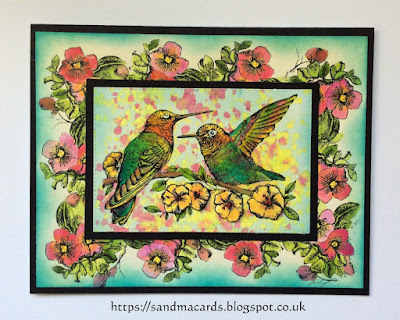 I stared by using a Gelli Plate to create my background and then using the Humming Birds stamp over it. The border was made using the edge of another stamp which I think worked quite well with it. The flowers below the birds were decoupaged to give some dimension. When it was finished, this card had a lovely French feel to it and is quite different from my usual style. Look at me….two posts in one day! I decided to use two of the new stamps together this time and so I made into an 8x8 card. 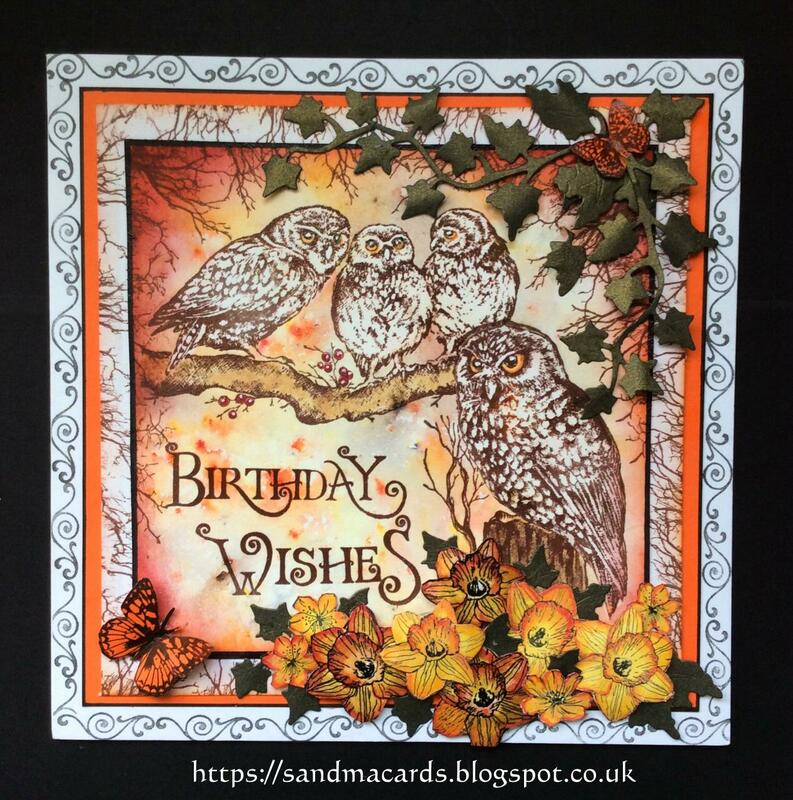 I created a background using Brushos and then I stamped the family of Owls before adding the larger Owl. I used a tree stamp to created the branches around the Owls and then stamped the sentiment. Finally, I stamped and coloured the daffodils before fussy cutting them out and then adding them to the bottom of my card. I used a silicone glue to give the daffodils some dimension. The Ivy was made using a Memory Box die. Although I've used autumnal colours throughout, I think that it works well for Spring too with the daffodils and butterflies.